The late Donegal-born politician and fair employment campaigner, Bob Cooper, expressed bewilderment at the reluctance of US companies to provide decent figures on the religious composition of their workforces during a meeting with senior civil servants in 1987, according to confidential state papers newly-declassified under the 30-year-rule. The Foyle College old boy and founding Alliance Party member told civil servants he believed most big American companies would have little to hide in terms of fair employment of Catholics and Protestants. He also said Derry-based companies - DuPont and the “Essex factory” (the former United Technologies on Bligh’s Lane) would likely offset under representation of Catholics elsewhere. Speaking in his capacity as head of the Fair Employment Agency (FEA), Mr Cooper, said he was opposed to the principles of “positive discrimination” formulated by former IRA Chief of Staff and Amnesty International founder, Seán MacBride, as he believed they did not comply with Northern Ireland law. “Mr Cooper found it difficult to understand the reluctance of US companies to monitor their workforce and to make their figures available and indeed thought that if the companies got together and produced a composite figure this would stand up very well,” a minute of the meeting states. “Only two of the companies got together and produced a composite figure this would stand up very well. 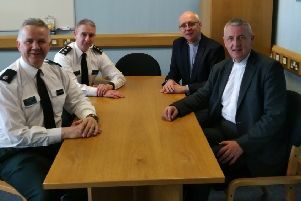 Mr Cooper also told officials that despite large numbers of Catholics working for big public and private employers in Derry in the late 1980s, high unemployment among Catholics was still chronic. He suggested Catholics were thus underrepresented on the workforces of smaller firms. “He commented that in locations such as Londonderry there was a large proportion of Catholics employed in public services and in the larger companies but despite this overall unemployment among Catholics was much greater. “This indicated that Protestant employment in smaller companies must be substantial.